Subscribe for the latest Cooking for One recipes and other bonus content. Sign up and receive the latest Recipes for One and other bonus content. When I think of healthy comfort food, Miso Soup immediately comes to mind. 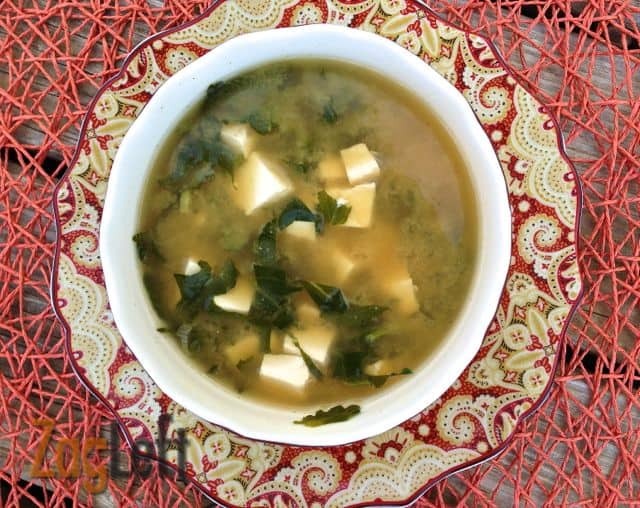 This Miso soup recipe without Dashi is light and is so full of fresh flavors. Best of all, it’s quite easy to prepare. 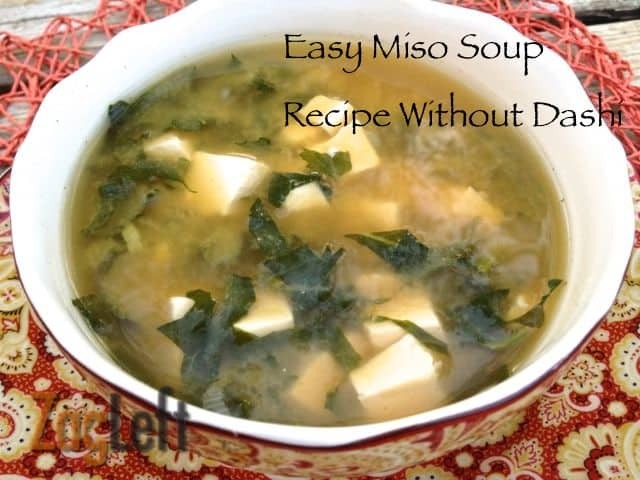 Miso soup is a very versatile soup. You can make it with vegetables, mushrooms, tofu, meat or seafood. The key ingredient is miso which is a Japanese soybean paste commonly found in dressings and marinades. I set out on a journey to recreate this soup. Miso soup recipes usually include Dashi (Japanese soup stock) and Kombu (dried kelp), both of which I could not find at my local grocery. Since I could not find Dashi, for this miso soup recipe I use vegetable broth as my base, I added three sliced green onions and finely chopped kale and let it simmer slowly on the stove. To that, I added diced tofu and continued to let the soup simmer so that the tofu absorbed all the wonderful flavors. After about ten minutes, I removed the pot from the heat and stirred in the miso paste. Here’s the important secret…DO NOT stir in the miso paste while the soup is cooking. Always turn off the heat, then stir in the paste. Please just trust me, you don’t want to boil the miso. I don’t like a salty soup and I found the miso paste salty enough so I didn’t add any salt. Feel free to add salt to suit your taste. Pretty simple…pretty easy. Give it a try, you’ll love it! Just a couple of things about miso paste… although I couldn’t find miso paste on the shelf in my grocery, please ask because it might be stored in bulk in the back of the store. Also, many stores do carry miso paste on the shelf so be sure to look around. As I mentioned, miso paste will keep for a long time in the refrigerator. Just make sure you keep it in the back part of the fridge and in a sealed container. You can use miso paste in salad dressings mixed with a little olive oil and lemon juice or in marinades and is especially good on broiled salmon. 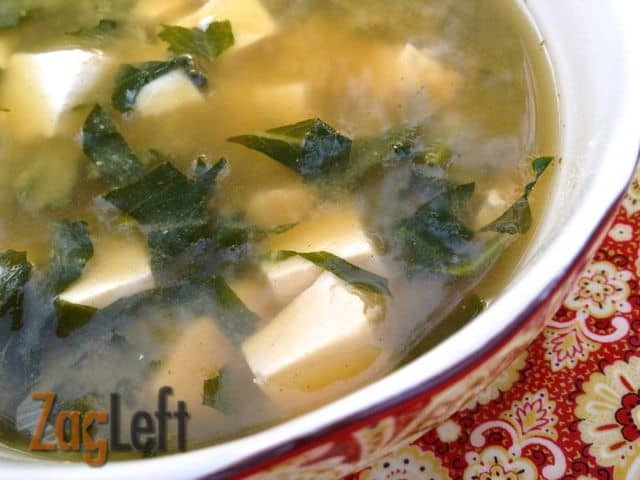 When I think of healthy comfort food, Miso Soup immediately comes to mind. It's light, it's fresh and is so full of flavor. Best of all, easy to prepare. Put the vegetable broth in a pot set to medium high heat and bring to a boil. Reduce heat to low and bring to a simmer. Add in the green onions and kale and cook for about 5 minutes. Add in the tofu and continue to simmer for another 5 minutes. Remove pot from the heat. Spoon the miso paste into a bowl and add a ladle of the soup (about 1/2 cup). Whisk to mix it and dissolve the miso paste. Add it into the pot and stir well. Subscribe for the latest Cooking for One information and other bonus content. Joanie Zisk is a freelance recipe developer and food writer/photographer, and blogs at ZagLeft. She loves creating in the kitchen, traveling, a great bottle of wine and yoga. She is the author of College Meals - 30 Days of Recipes and has written for many online publications. Come say hello and follow Joanie on Facebook, Pinterest, Instagram and LinkedIn. Wow. This is so easy to make. I love miso soup. I’m going to give this a try. Thanks. trying it tonight. thanks for posting. I tried with red miso, not very good, need to try something else. Definitely what I am finding for! I love Miso soup but the dashi is quite a problem for me. Will give it a try tonight! Great, Aeron! Hope you enjoy the recipe. Just wondering, how many servings does the recipe above make? 🙂 Thank you! I would say this would serve 2-3 people. Thanks so much for reaching out. I’d love to hear how it turned out for you. Soup came out great. Because we’re a large family, I tripled the quantity of broth and veggies but I only added in the miso paste as people were ready to eat the soup (so I did about 4 cups of broth at a time mixed with the miso). I heated the veggies and broth and then added the miso as needed. Thanks for a great easy recipe. I’m so glad you enjoyed the recipe, Sharon. Thanks so much for letting me know. Have a great week! I had the same problem trying to find Dashi in my city and was searching for a replacement when I found your recipe on the web. It is really easy and very delicious, both me and my wife really enjoyed the results. I have definitely added your recipe to my book. Thanks for sharing your recipe with us !!!!!!!! I’m so happy you liked the recipe! Thank you so much for letting me know. Like I said, I love your recipe, it’s easy and delicious. I make just a small modification. Instead of the kale, I use the dried seaweed from the sheets used for making sushi, which is easy to find in most cities. My 9 year old daughter likes sushi, which we make at home, but she likes the rolls a bit smaller, as she finds the full sized rolls too big for her mouth. So I break a quarter or so off the sheets when I make sushi for her, and use the quarter sheets broken up in the soup. The Japanese use seaweed in the soup, but I don’t think they use the seaweed sheets, I think it is a different form, but the seaweed from the sheets works very well. Anyone with children who love sushi should try the smaller rolls, they are easier for them to eat. We used to buy it in the supermarket, but it is expensive, and so easy to make at home. After a few times of making it, the homemade sushi is nearly as good as from the supermarket, and a small fraction of the price. And the leftovers of the sheets from making sushi go great in the soup. Thanks again for you lovely and helpful blog!!!!!! Thank you for sharing your idea of using the dried seaweed sheets, I will have to try using those. I’ve only made sushi once at home and I had so much fun making it, you’ve inspired me to give it a go again. Have a great day!